Working an outcrop in the Clays Ferry Formation that is in the same bed, and close to, another outcrop that I have collected extensively(see here, here, and here), I came across some curious molts of an Isotelus gigas. The Clays Ferry Fm was deposited in a relatively shallow subtidal environment, and throughout most of the area, the formation straddles the Mohawkian/Cincinnatian boundary(early Late Ordovician). Due to deposition below wave base in typical weather, most of the fossil are complete and a diverse assemblage can be found in the column. The Bed form which this piece comes is composed primarily of orthoconic cephalopods, Isotelus, a few bivalves, and an occasion Flexicalymene trilobite. What I find curious about the molts is found on pygidium and thorax of the smaller dorsal specimen. I have annotated it with a white line to highlight the area. There is a crack and indentation that runs from the anterior posterior(Jeeez, I just caught that) margin through the pygidium, and from there it appears as if it continues on through the pleurons. As there is no suture along that area of the thorax, I would assume that the distal portions of the pleurons would be adjacent to the rest of the critter, but they are not there, So that has left me wondering if the structure is pre-molt, or if it is an artifact of lithification. Any Ideals? Upon returning to Lexington, one of the first outcrops that I looked forward to collecting was a relatively small outcrop of the Millersburg member of the Lexington Limestone. 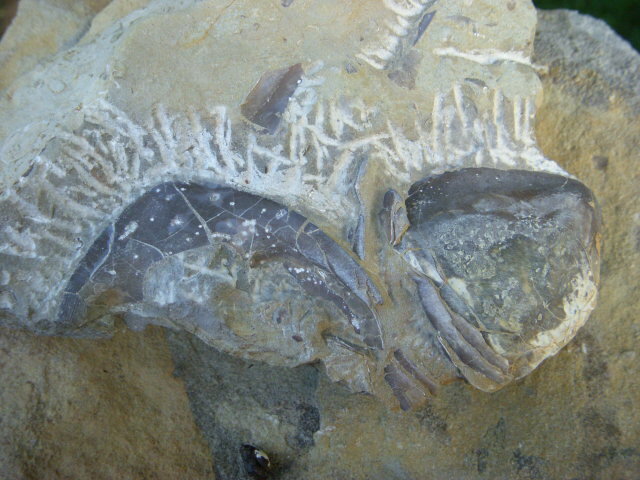 I worked the outcrop for 8 years back in the 80s, and it produced some stunning fossils. But, I have found some spectacularly preserved inverts from the member. 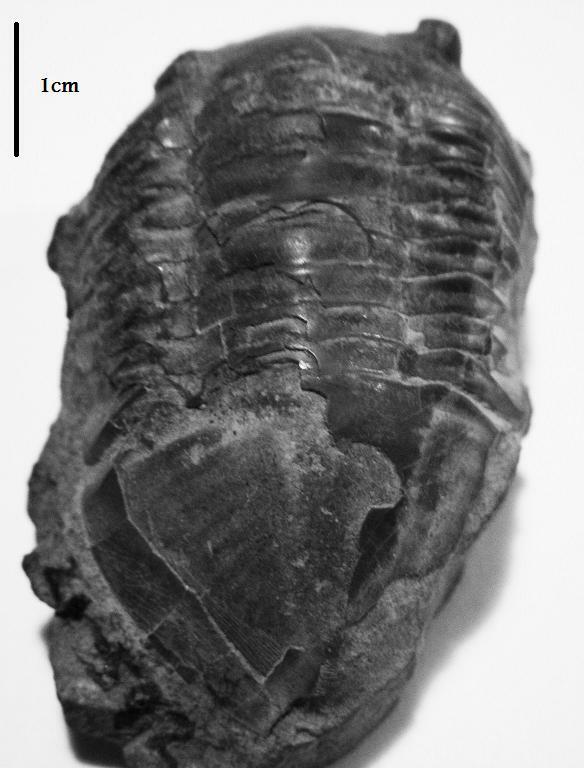 I pulled a well preserved example of coprophagious(poop eating) symbiosis among the gastropod Cyclonema varicosum and a crinoid from the member 25 years ago, but even better, I found an undescribed lichid trilobite from the same locality! And, that is what bring me to this post. That wonderful outcrop, with all of its rare fossils, is no more. I then moved on to the next outcrop that wasn’t destroyed, and it was a good one. 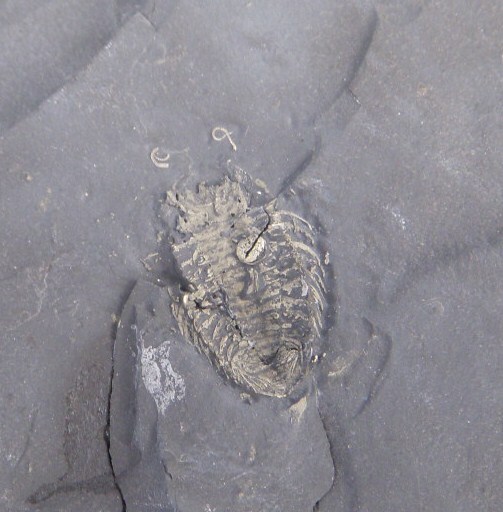 Other than most of the Pychnocrinus that I have displayed on the blog, I also found a partial pygidium from a lichid trilobite. Usually, I would pass on something as insignificant as a partial pygidium, but it was from a lichid. Too remember, I pulled an undescribed lichid up the road a bit. 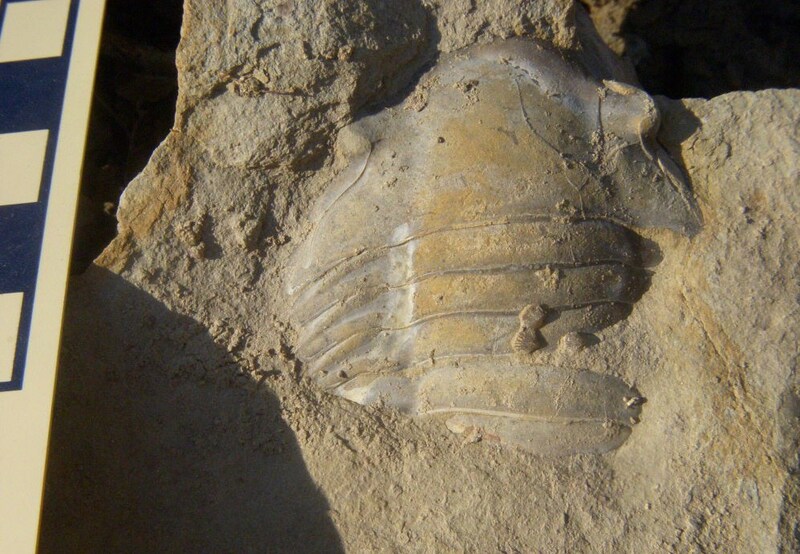 The undescribed trilobite consists of 11 cephalons, two pygidia(is that the plural? 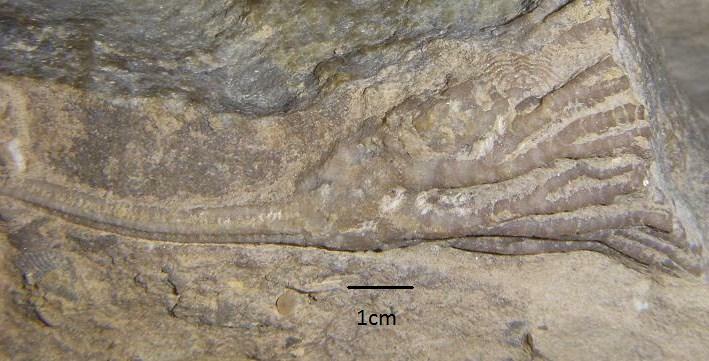 ), and one hypostome. Anyway, here it is. It doesn’t look like much, but it sure got my heart racing. Year ago while working an outcrop that has produced some stunning asasphids, I found this little Isotelus gigas. It appears that the little guy had a bite taken out of his cephalon, enrolled and died. 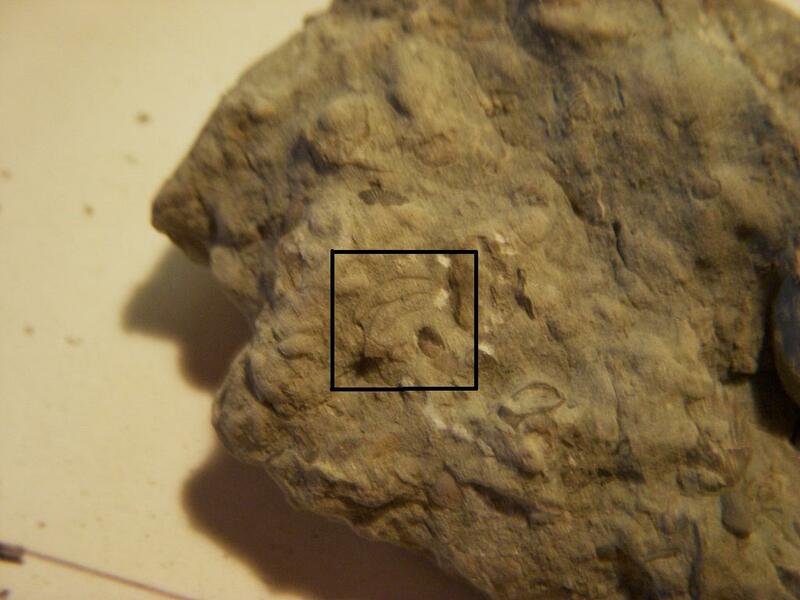 I found it in a bed of the Clays Ferry Fm(early Late Ordovician) in Anderson Co. Kentucky. The bed is comprised of, almost entirely, I. gigas molts and orthocerid cephalopods. 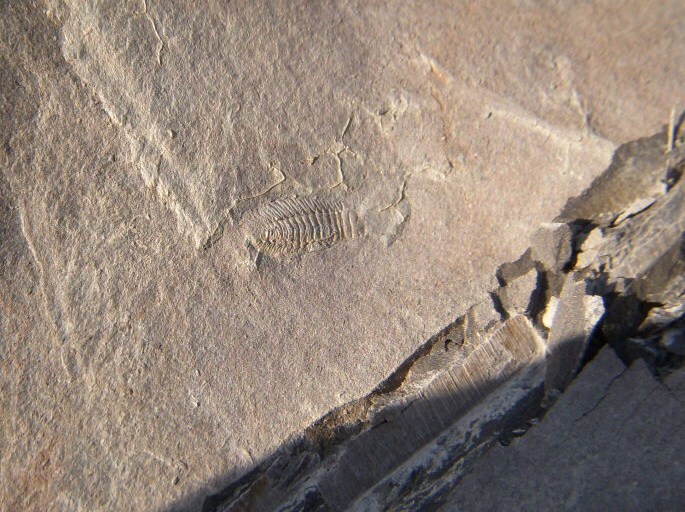 A while back, Chris over at Ediacaran put up a post in his “Paleoporn” series describing the environment and sedimentology of two sites, in the same formation, where the same Cambrian trilobite is found. His post is a description of the orientation of the molts in the two different environments. In the comments, we discussed the curious habit of finding inverted cephalons, ie, ventral up cephalons while the rest of the critter is found in its normal position(dorsal up). In a thin bed of the Clays Ferry Formation in Anderson Co. Kentucky, I find numerous partial molts from the trilobite Isotelus gigas. 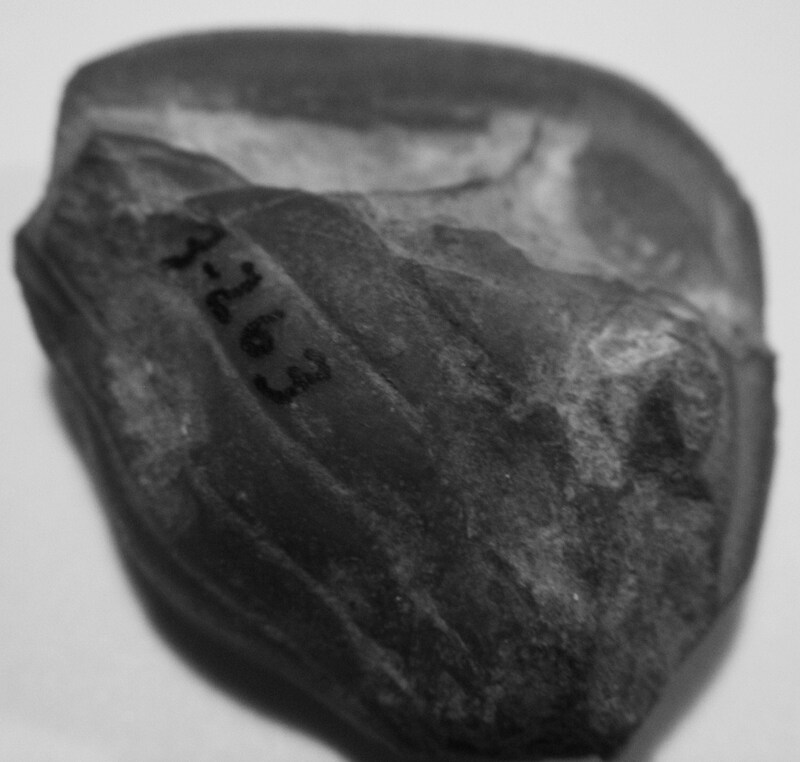 Some of the bedding planes are almost entirely composed thoracic segments, cephalons and cranidiums, and pygidiums from this large asasphid. Occasionally, one comes across the curious preservation described above. 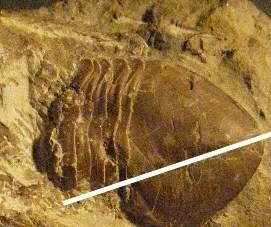 During ecdysis, the cephalic sutures of the trilobites rupture allowing the critter to escape from the front of its carapace. Sometimes during the egress, the critter will push the cephalon upside down. Hence, what we have here. When I found this one, it didn’t appear that much was there. But, I brought home anyway. While hitting it with a scribe, I noticed the ventral, but I thought that it was trash and nearly blew through it… as more became apparent, I slowed up a bit(word to the wise). I have found several more from the same locality, but those are all that I have photographed. However, here is a nice juvenile that appears to have had a bite taken out it. The Ordovician of New York has been a fascination of mine since reading of C.D. Walcott’s discoveries, there, many years ago. A couple of years ago, I was granted the opportunity to visit a newly discovered lagerstatten in the Lorraine Group of Upstate New York. 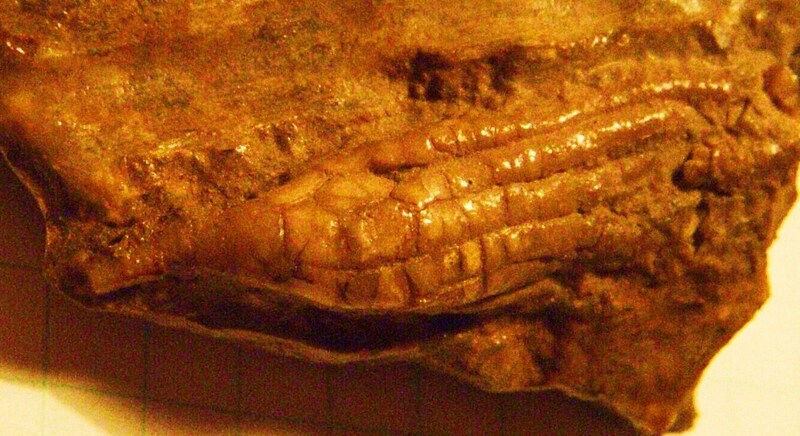 The site was discovered by an amateur paleontologist from the region. 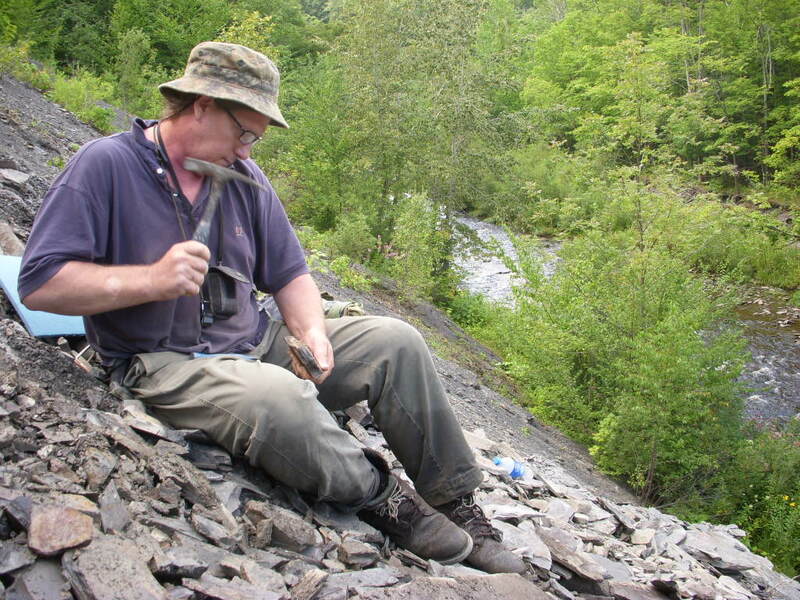 In his quest to better understand the geology and paleontology of New York, he found the site that we visited, and several others that have produced stunning soft-tissue preservation of annelids and arthropods. 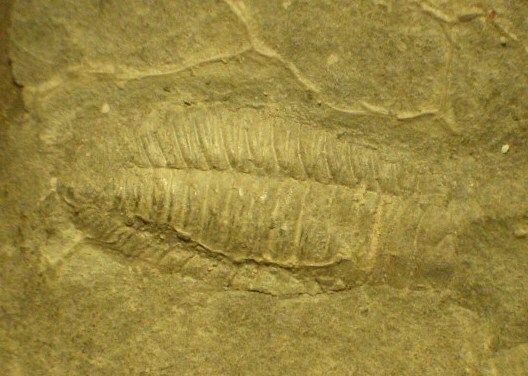 The Martin Quarry is located in the Whetstone Gulf Formation of the Lorraine Group in New York about 60 or 70 km north of Beecher’s Trilobite Beds. The rocks were deposited in a deep foreland basin that formed as a result of the Taconic Orogeny during the early Late Ordovician. 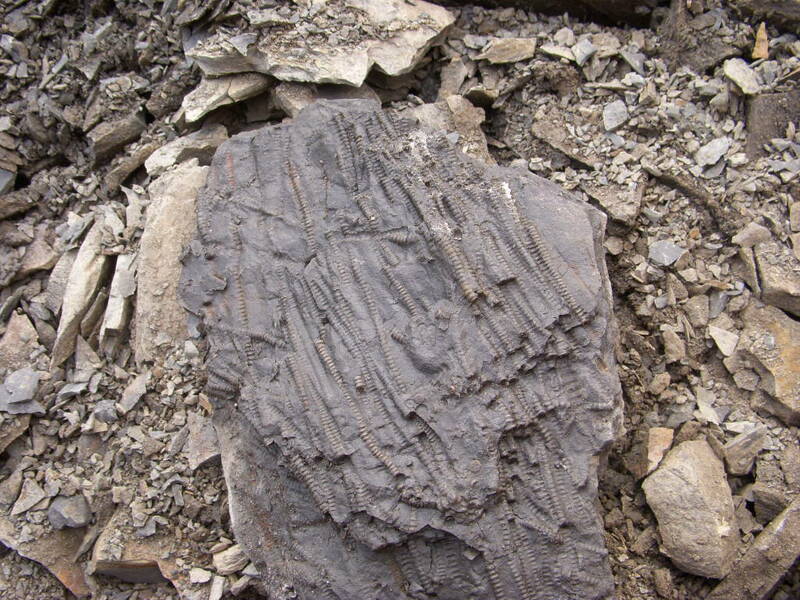 The Late Ordovician was a time of intense tectonic activity on the Laurentian continent. As a result, the rocks of the Lorraine are characterized by sequences of turbidites. 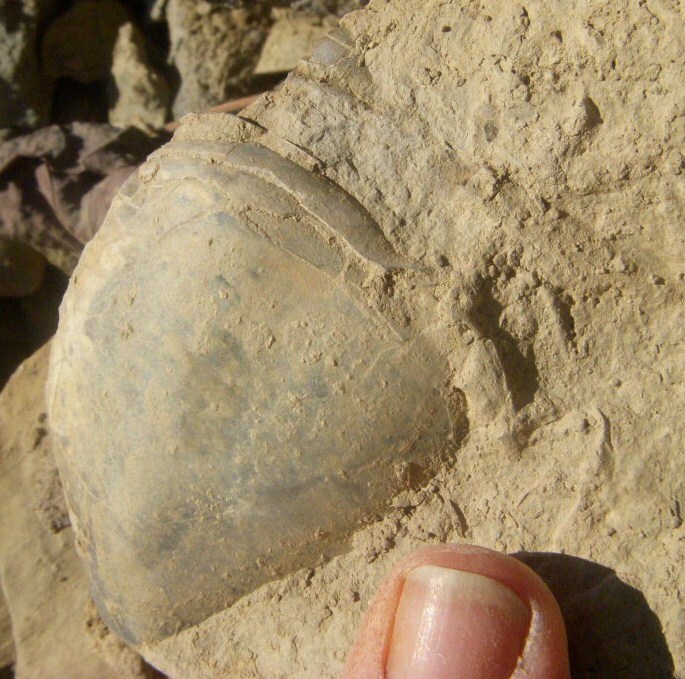 It is within the turbidites that the exceptional preservation of the fossils are found. 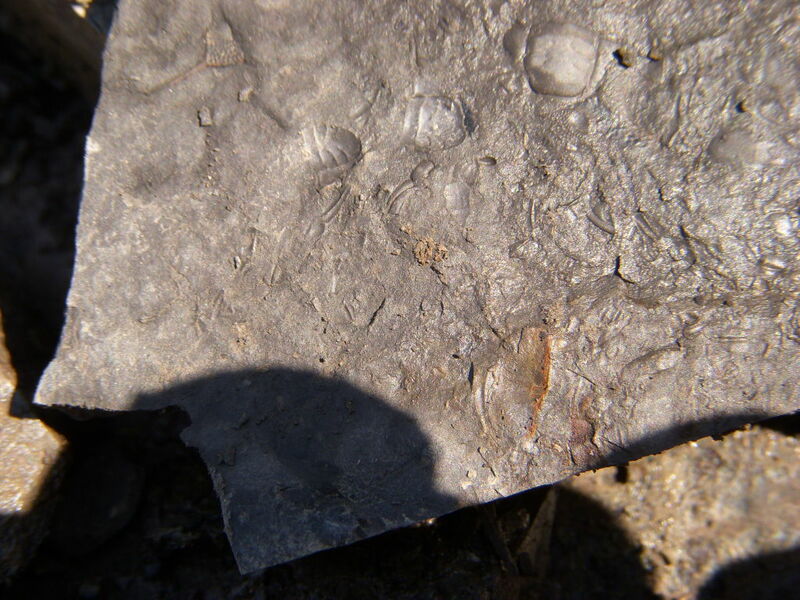 Bedding planes reveal hash plates with numerous partial trilobites-among other critters, but within the beds, whole critters can be found. And, if one is in the right horizon, the critters soft parts are preserved in pyrite. 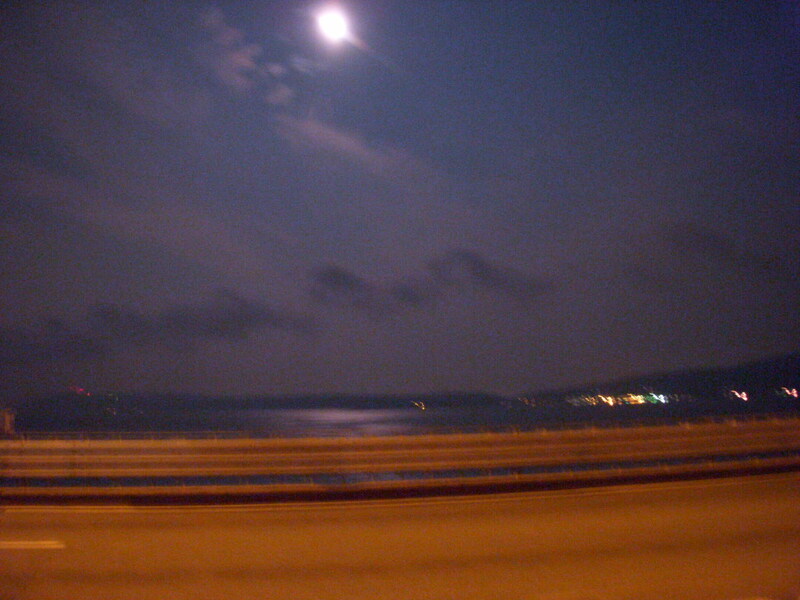 After picking up a prep guy(one of the best in the field) at JFK, we got stuck in a traffic jam on the Tappan Zee… at 03:00! 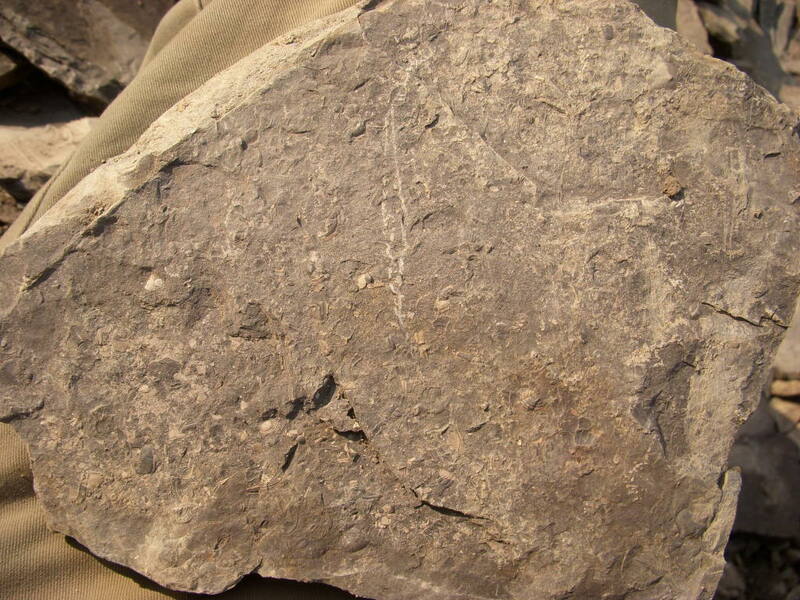 Curiously, crinoids are absent from the locality, but they were somewhere, nearby. The first thing that I saw when walking up to the outcrop was this lovely cephalon. The site is known for its Triarthrus fauna, and I was expecting it, but… this was the first Triarthrus that I had seen in the field! I was stoked! A photo of me chopping away. 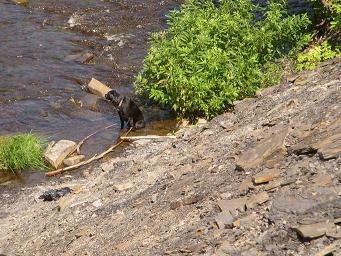 A photo of My Good Friend Who Is A Dog chillin in the creek. 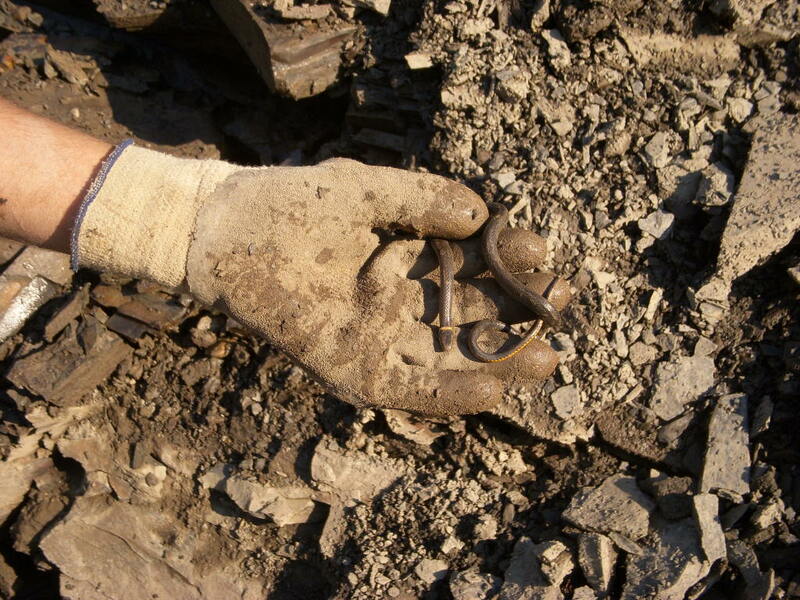 Some kind of reptile… I might add, this guy shouldered(literally) a couple of tons of shale in an attempt to protect his finds, only to put on the gloves for this critter. Probably, 75-100 partials on the slab. The guy that found this quarry developed a revolutionary an innovative technique in the preparation of pyritized soft tissue recovery… his methodology, at first, seems counter-intuitive, and maybe destructive, but his results are telling. 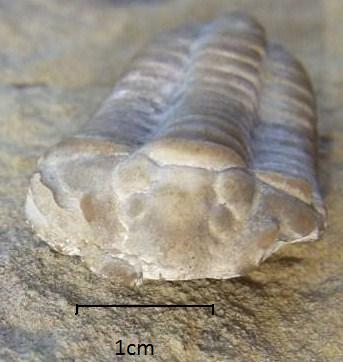 Years ago, while at a friend’s farm in Anderson Co. Kentucky, I noticed a small bed of rock(calcilutite) in the Clays Ferry Formation(early Late Ordovician) that was composed of, almost entirely, “orthoceras” cephalopods and partial pieces of the trilobite Isotelus gigas. 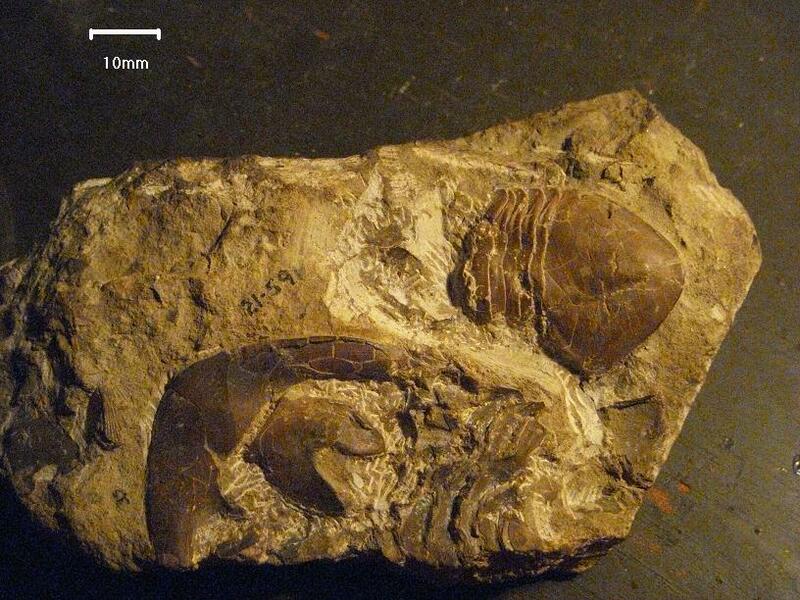 Upon further examination, I discovered that the bed contained quite a few complete, or nearly complete, trilobites. With a little patience, and a hammer, one could pull, at least, one or two complete “bugs” with every trip. 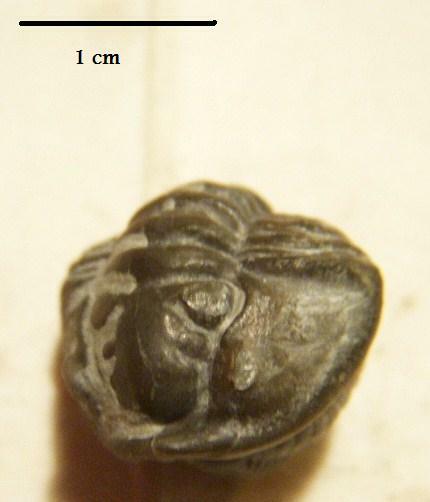 One day while working the creek, I noticed a piece of float that contained 5 crinoid heads. I left the area shortly after, and unfortunately, was never able to locate the bed that contained the crinoids. Interestingly enough, the piece of float also contained a few conulariids(I’ll post those soon). 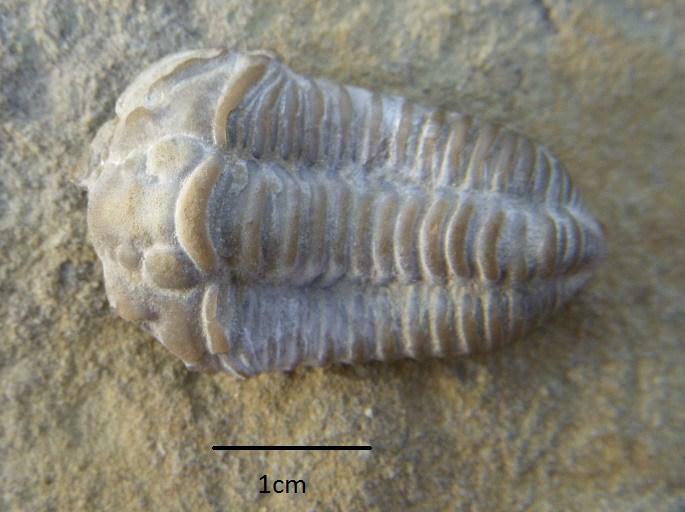 The reason for the post is this beautiful, and somewhat rare, disparid crinoid-Columbicrinus sp. that was found that day. It is the best of the bunch. Now, that I am back in the area, I hope that the bed that contained this handsome critter will finally be located. Gravicalymene are often confused with their better known “cousins”, Flexicalymene. Many amateurs confuse the two, and I have seen a few Gravis improperly labeled as Flexis. Probably, the easiest method to distinguish the two is the shape of the glabellar furrow. In Gravicalymene, the furrow has a distinctive bell shape; in Flexicalymene, the furrow is more trapezoidal or triangular shaped. But sometimes those distinctions aren’t apparent. 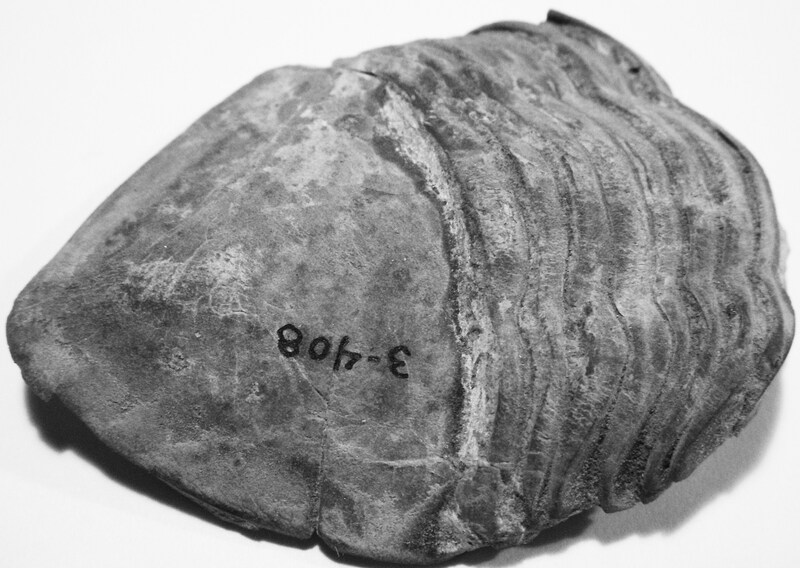 This Flexicalymene retorsa was collected from the Arnhiem Fm near Cincinnati Oh. It appears to have the classic “bell” shape of the Gravis, but look at the furrow on the left side of the image-the trapezoidal shape is seen. This is a molt that was collected beneath a stromotoporoid. The bell shape is there, but to avoid any confusion, the pygidium of Gravicalymene has five interpleural furrows, Flexicalymene has 6 or 7. Evidence seems to suggest(published soon???) 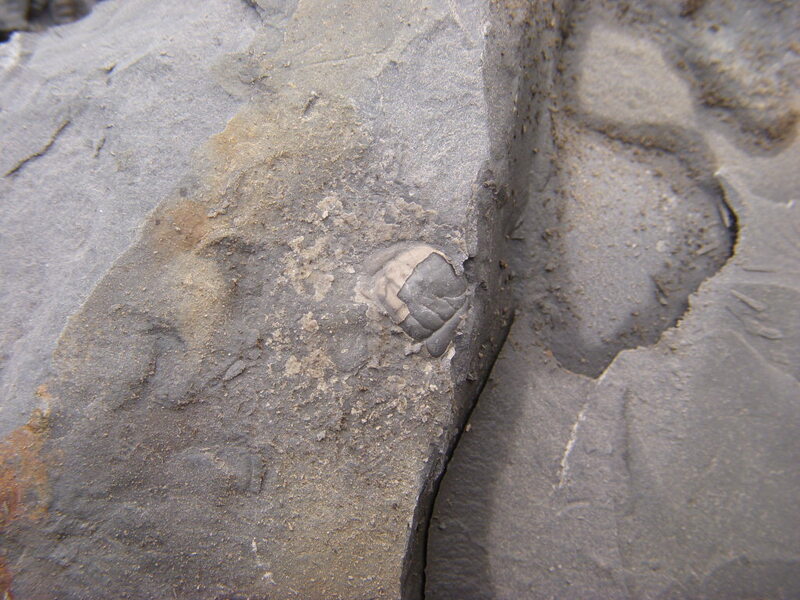 that trilobites would seek out safe havens during ecdysis. 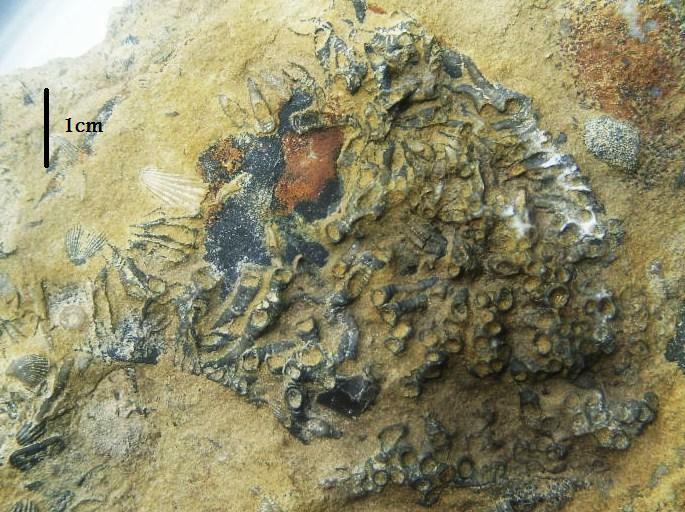 Hence, the critters found beneath sponges, bryozoa, and other structures. 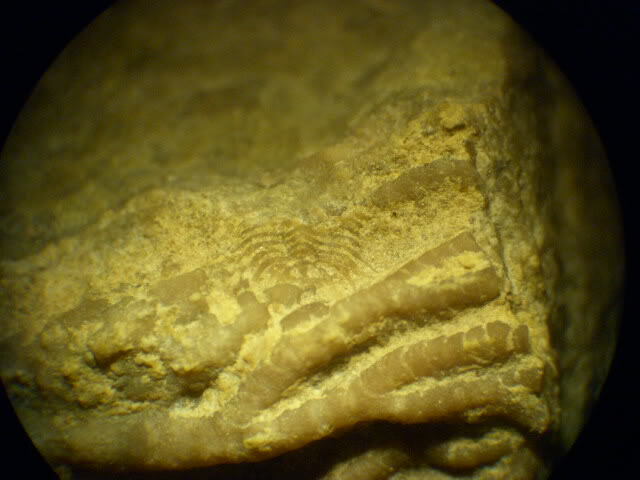 Cornulites are generally found on sessile critters, but recently, I found a colony of worm tubes attached to partial carapace from the trilobite, Isotelus gigas. It appears that the epibionts found their home on a molted carapace, rather that on the living critter. Today’s photograph is of an unusual association of an odontopleurid trilobite and a diplobathrid crinoid that was collected from the Ordovician of Kentucky. 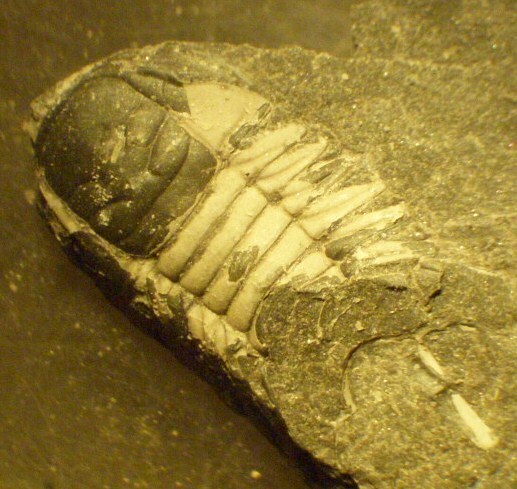 The trilobite(Acidaspis sp) is seen on the top most brachial of the crinoid(Reteocrinus sp. ), in the photograph. I am still trying to determine if the assemblage represents thanatocoenosic(death assemblage) preservation of a community, or post mordem predation by the trilobite, and then preservation.